One does not simply distribute Call of Duty in China. 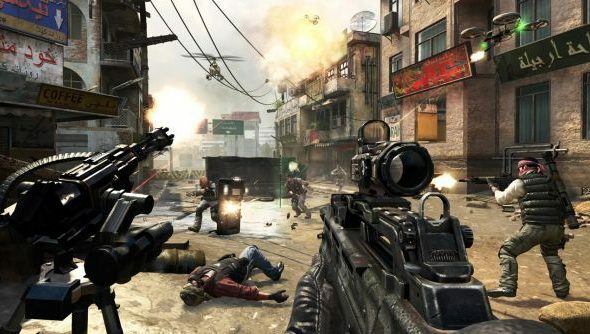 The law there requires that foreign publishers partner with local studios on a given project – which means that, for the past few years, Activision have been working with Tencent on the free-to-play and redundantly-named Call of Duty Online. They must’ve nearly finished, because they’ve popped out a trailer starring a Marvel action hero. And which Marvel action hero does Call of Duty best identify with? I think you know. In many ways, Activision’s modus operandi hasn’t changed for China. Call of Duty adverts still offer to pick you directly out of your boring life and air drop you into cooperative chaos. The production values don’t really pass muster when compared to Activision’s recent live-action efforts for Call of Duty: Ghosts, but Chris Evans compensates with all the earnestness he learned as The First Avenger. The game itself looks familiar: Call of Duty Online has zombie robots, breaching and clearing, black-and-white drone strikes and downed Black Hawks. We’ll probably never play it. But we’re hardly short on alternatives, are we?Call of Duty: Advanced Warfare has John Malkovich, after all.